Kyler Murray announced Monday that he is “firmly and fully committing my life to becoming an NFL quarterback.” That, of course, sent Draft Twitter and those in the New York Giants fan base who are crushing on the idea of Murray replacing Eli Manning into a frenzy. 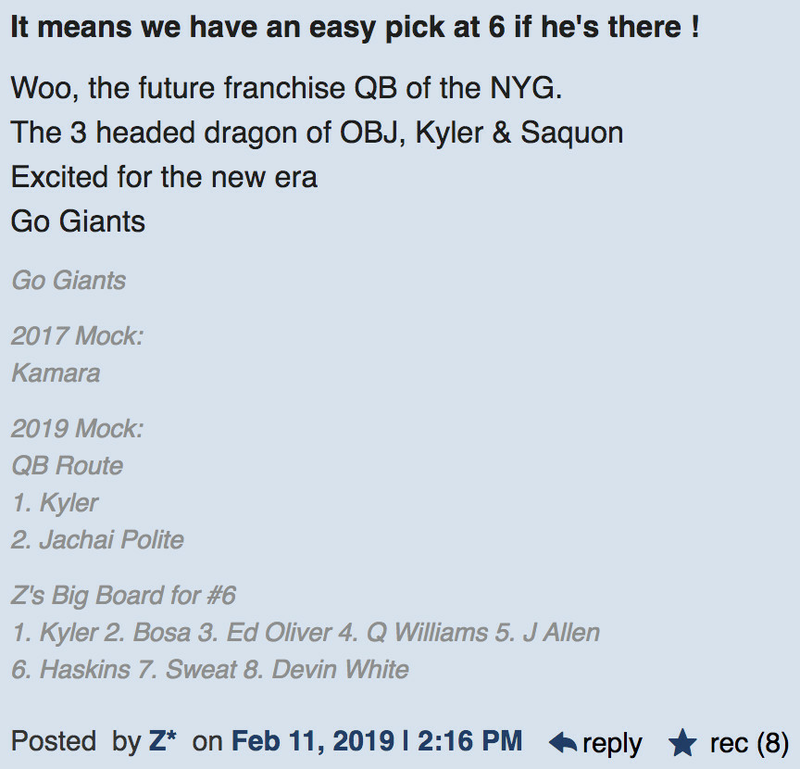 There were plenty of “the Giants should draft Murray” tweets. Ralph Vacchiano of SNY came out quickly with a report that a source inside the organization told him that Murray is “probably a little too small” for the Giants. Since any team that wants a quarterback knows they probably have to trade above the Giants to guarantee they get their guy, the more first-round quarterbacks there are, the less of an urgency there’ll be to move up. And if any of those other teams fall in love with Murray, they can feel safe that he’ll still be there after the Giants pick. This should come as no shock to Giants fans, especially ardent readers of Big Blue View. It is something I have been saying for a while. Nothing we know about the Giants tells us Murray would be their guy. First, we established that teams, scouts, GMs, everyone in fact, enters an evaluation process with pre-determined biases. “If you can’t make plays from the pocket you can’t win,” Gettleman said during last year’s pre-draft buildup. Our Dan Pizzuta is resigned to this, but not happy about it. I’m going to disagree with Dan here. Maybe it’s conservative. Maybe it’s traditional. Maybe it’s not what a millennial or a Madden GM would do. It isn’t “dumb.” There hasn’t been much success lately, but the Giants’ way of doing things has gotten them four Super Bowl titles. Murray is a highlight reel. He’s got a great arm. He’s exciting to watch running all around — at the college level. Yet, no quarterback his size has ever succeeded in the modern NFL. There is no precedent, no evidence, nothing for anyone to point to that proves drafting Murray — or any QB his size — can work. Quite simply, it’s never been done. No one wants to get fired, and gambling your franchise’s future on Murray is taking a big (small?) risk with your employment status. Murray might succeed somewhere, but remember what Dan Hatman told us. It’s going to have to be a place ready to fully embrace what Murray is. “For one organization he’s [Murray] going to be a fit and they’re gonna be excited and love him up and want him to be their guy, and that’s the place he should go,” Hatman said. “That’s the best chance for him to be successful. Like it or not, the Giants seem like an organization that is not ready for a 5-foot-9, 190-pound quarterback. Now, mark my words here: There is ZERO chance of this happening. I’ll eat my socks on live TV if GM Dave Gettleman drafts a quarterback in the first round who’s close to 5-foot-9. But in a hypothetical fantasy world in which the Giants, who have the No. 6 pick, occasionally broke from decades-old philosophies and patterns, this kid would fire up a locker room full of electrifying talent. The Giants have used the same grading system since George Young took over and in that system, they would have a hard time giving Murray a high grade. the system is designed to prevent the team from being small–its all about size and speed. Former general manager Ernie Accorsi once explained it to me like this: “It attaches a letter grade to your number rating as a player. On a nine-point system, if you earn a seven to eight, which is very high, but you were undersized compared to the average NFL specifications according to that position’s average size, they put a ‘C’ next to it. So even if a player is a seven to eight, the “C” serves as a red flag. Teams would do the same thing with speed, quickness, awareness or other secondary attributes that all received letter grades. The grades would then disallow a club from choosing that player in the first round or, depending on the importance, the second round. More than 20 years since he left the Giants and 17 years since his death, Young’s teachings are still at the core of the organization. Accorsi worked for and learned from Young, and both Gettleman and Jerry Reese learned from Accorsi. The Giants don’t do everything the way Young did. Gettleman admitted last year that he learned some things while GM of the Carolina Panthers that he had implemented into the Giants’ scouting process. Unlike Graziano, I won’t go on live TV and eat my socks if the Giants draft Murray. Like Graziano and others, though, I just don’t see Murray to the Giants happening. It would be a seismic shock if the Giants were to toss away their long-held belief that size matters.